Margaret Thatcher (1925-2013), sometimes referred to as Maggie Thatcher, was prime minister of Great Britain between May 1979 and November 1990. Thatcher was born Margaret Roberts to a lower middle-class family in Grantham, Lincolnshire. Her parents were both devout Methodists, her father a grocer and her mother a seamstress. Roberts was an outstanding student in high school and won scholarships to attend Oxford, where she graduated with a chemistry degree. While at Oxford Roberts was also involved in student politics, serving as president of the university’s Conservative Association. She worked for several years as a chemist while participating in conservative political groups. Roberts stood as a candidate in the 1950 and 1951 elections, losing narrowly despite being a young woman running in safe Labour seats. In 1951 she also met and married businessman Denis Thatcher and took his surname. Mrs Thatcher was elected to parliament in 1959, representing the London seat of Finchley. As one of only 25 women in the British parliament, she attracted a considerable amount of media attention. In 1961 Thatcher was promoted to the front bench and given responsibility for pensions. In 1970 she entered cabinet as the Secretary of State for Education and Science in Edward Heath’s government. Five years later Thatcher defeated Heath in a ballot to become the leader of the Conservative Party in opposition. During the 1970s Thatcher made her name as an erudite, forceful and sometimes antagonistic public speaker, both within parliament and in the public forum. Her favourite targets were the Labour Party, Britain’s powerful unions and the Soviet Union, which she once alleged was “bent on world dominance”. Her stern and uncompromising public persona led one Soviet newspaper to nickname her the ‘Iron Lady’. 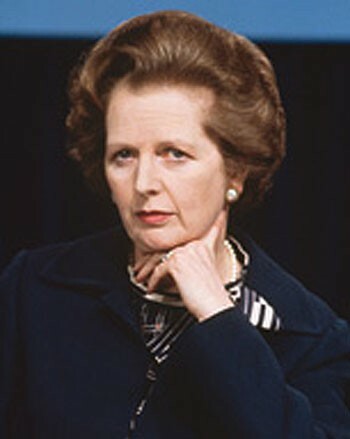 Thatcher became prime minister after winning a general election in May 1979. Domestically, her government undertook sweeping economic reforms, such as reducing taxes, undermining the power of trade unions and privatising mines and heavy industries. 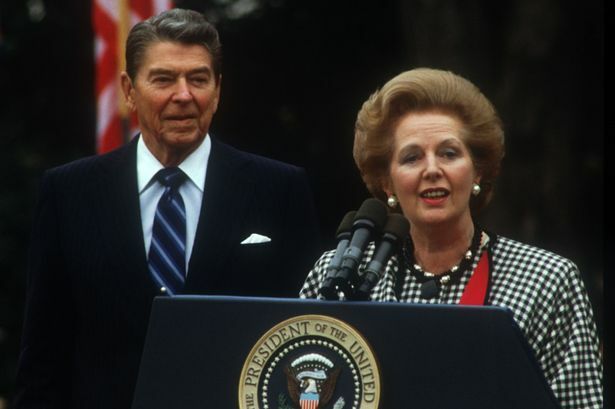 In foreign policy, Thatcher’s outspoken criticisms of communism matched those of United States president Ronald Reagan, who became her friend and closest ally. Thatcher’s government increased defence spending, increasing Britain’s nuclear arsenal by almost 200 percent. She also allowed the US to install dozens of nuclear cruise missiles at an air force base in Berkshire, triggering long and acrimonious anti-nuclear protests. In 1982 Thatcher ordered British naval and amphibious forces into the South Atlantic to liberate the Falkland Islands from an Argentinian invasion, a conflict not directly related to the Cold War. Despite her tough stance, Thatcher was willing to connect and engage with communist leaders. In 1982 she became the first British prime minister to visit the People’s Republic of China. She met future Soviet leader Mikhail Gorbachev in 1984, writing later that she found him good company, “a man with whom I could do business“. Thatcher visited Moscow in 1987 and accepted Gorbachev’s planned reforms with good faith and encouragement. Unpopular at home because of her austere domestic policies, Thatcher gradually lost the support of her party. She was forced to resign from the prime ministership in 1990. Thatcher retired from politics in 1992, making only occasional public statements and appearances thereafter. In 2004 she travelled to California to attend the funeral of her Cold War partner, Ronald Reagan. Thatcher suffered poor health and dementia in her final years, most of them spent in seclusion and nursing care. She died in April 2013 and was given a state funeral. J. Llewellyn & S. Thompson, “Margaret Thatcher”, Alpha History, accessed [today’s date], https://alphahistory.com/coldwar/margaret-thatcher/.